Podcasts are a great way to listen to audiobooks but they do take a little bit of time to set up. You’ll find that once you have the software installed and working, podcasts are one of the fastest and easiest ways to listen to audiobooks. They let you see all the chapters of your book and switch between them. 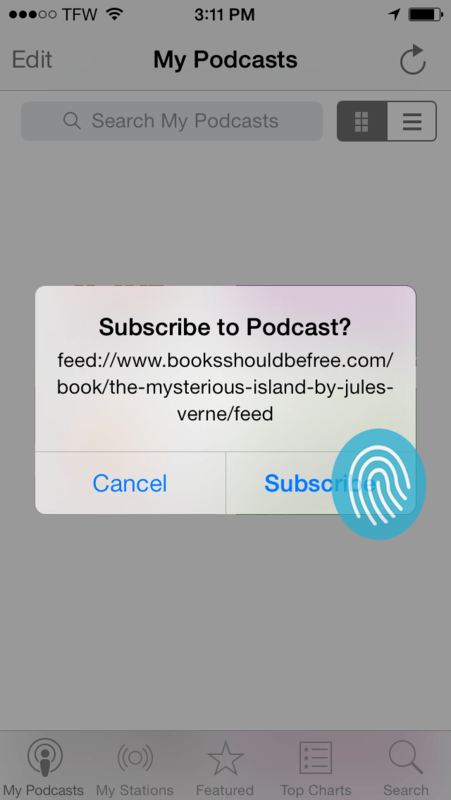 Podcasts also save your place like a bookmark in a paper book. 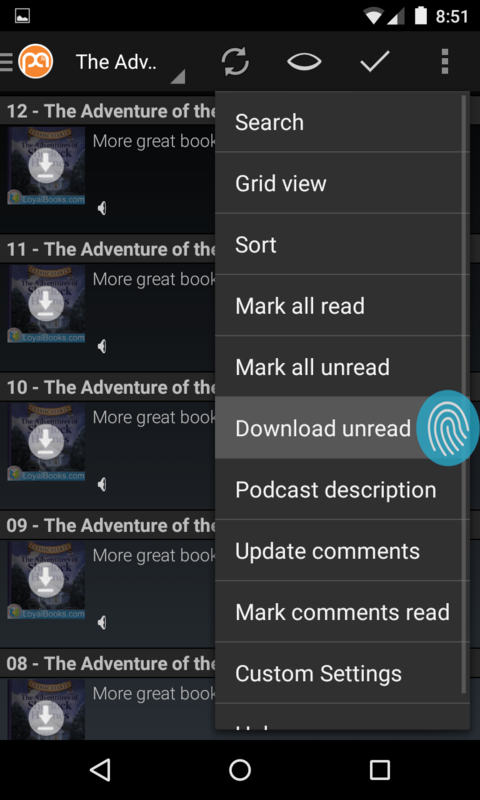 Finally podcasts will let you change the playback speed so that you can get through a book faster. The easiest way to get going with podcasts is to use an iPhone and download Apple’s podcast app. 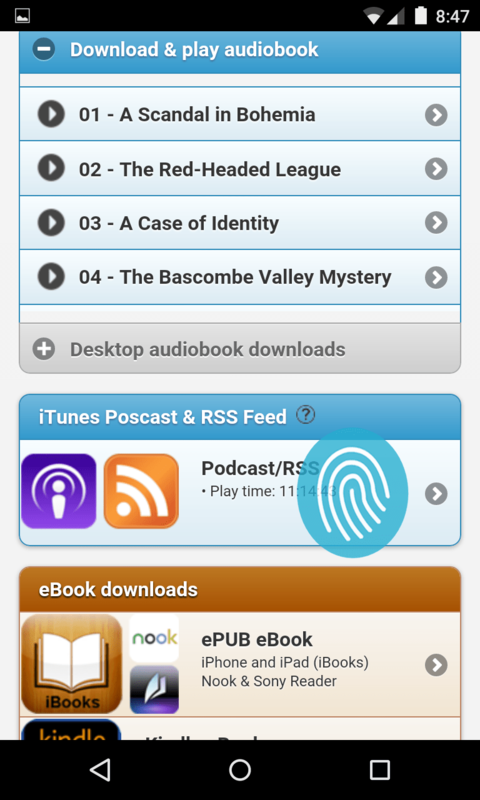 Once the podcast app is installed you can use Safari to browse to BooksShouldBeFree.com and when you find your favorite book click on the podcast button. 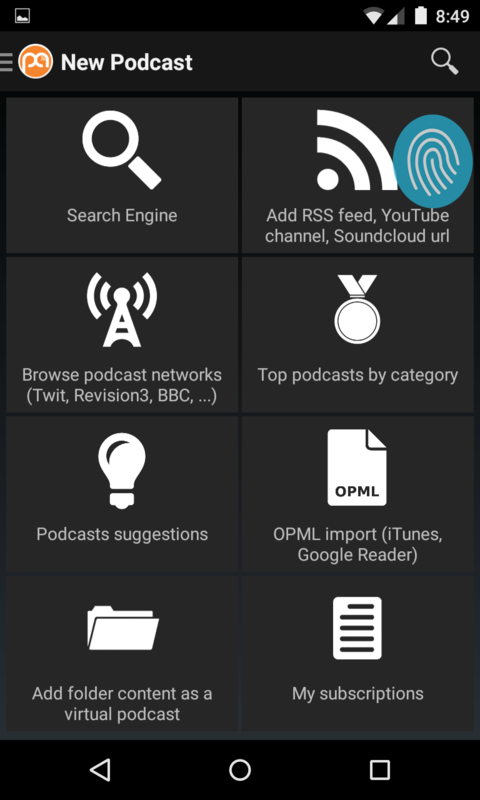 Next switch to the My Podcasts section at the bottom of the app and then select the new podcast that you just subscribed to. 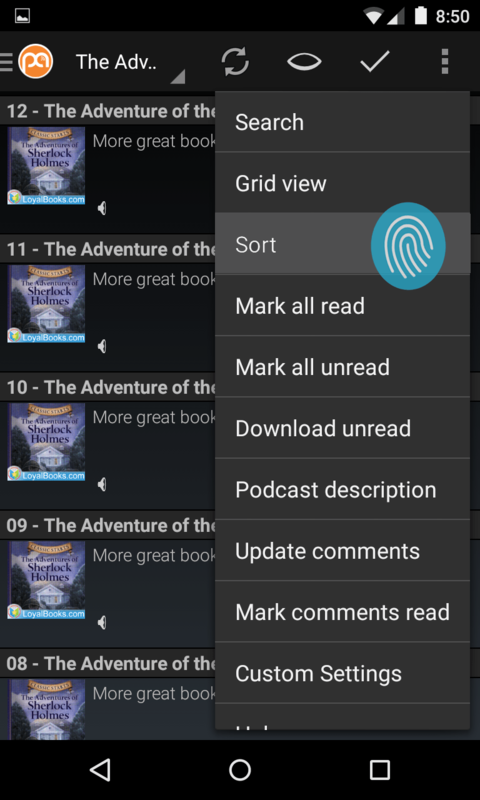 Now you can select Add Old Episodes and select all the episodes or just the ones that you would like to listen to. 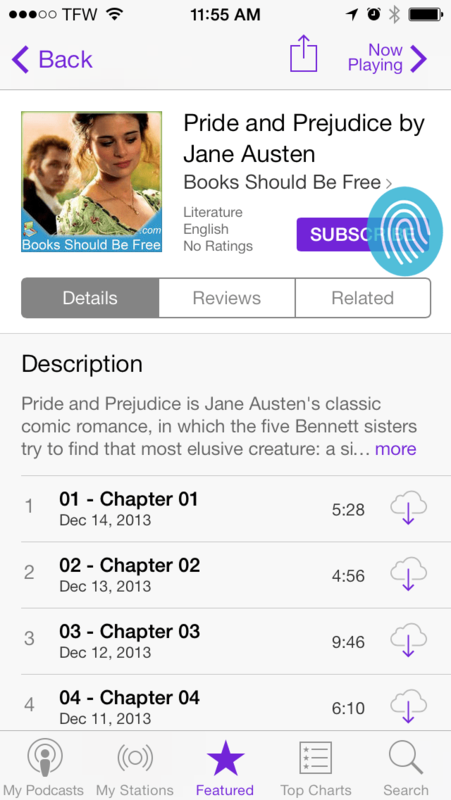 By default Apple’s podcast app will just play one chapter of the book and stop. If you would like it to automatically start the next chapter you can go into the settings area. Then you can select Play Order and change it to Newest First. Now you’re all set to enjoy your podcast. 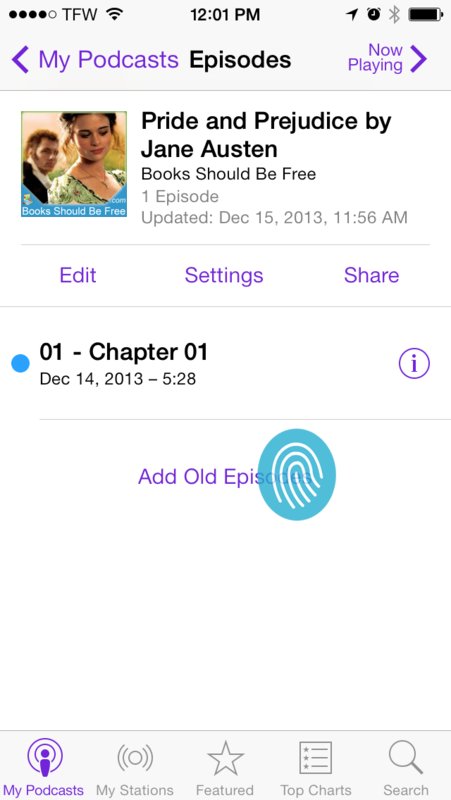 Just navigate back to the podcast and select the first chapter to listen to the book. 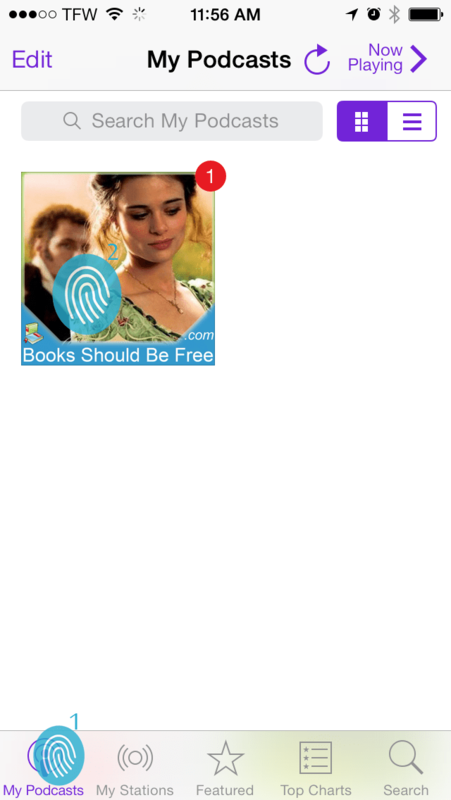 Next look for the iTunes icon on a book page and click it to add that book to iTunes. Depending on your browser you may get a confirmation dialog box like one of the following. After confirming you the next step is to subscribe in iTuens and confirm your subscription when prompted. The next step is to click on the podcast area and then on Add Old Episodes. By default iTunes only downloads the first chapter of the book and this step ensures you have the entire book downloaded. Once on the Add Old Episodes screen you’ll want hit Add All and then Done. Now there is one final step. 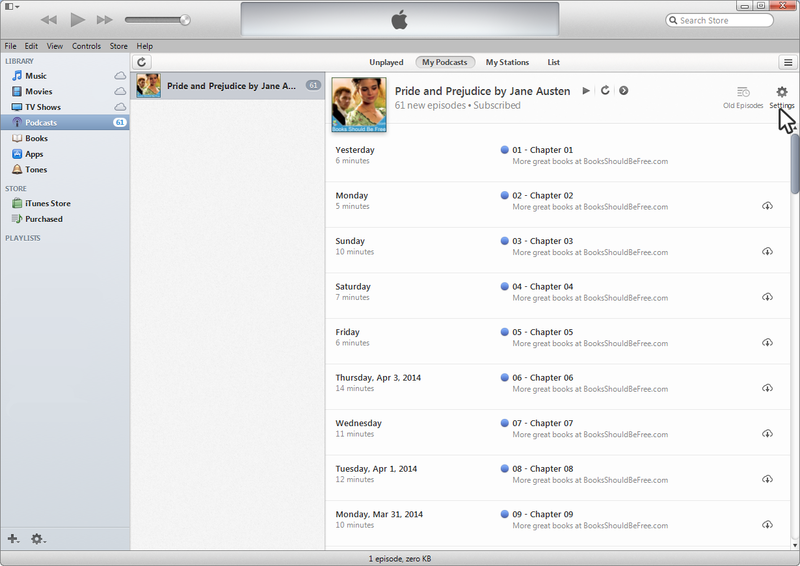 By default iTunes plays one chapter of the book and then stops. To set iTunes to play one chapter after another you’ll want to go into the settings area and select Play Order > Newest First and finally click Done. That’s it. Your podcast is all set up and ready to play. Just click on the first chapter to start listening. If interested you could also plug in an iPod or iPhone and sync the podcast onto your device so that you can listen on the go. 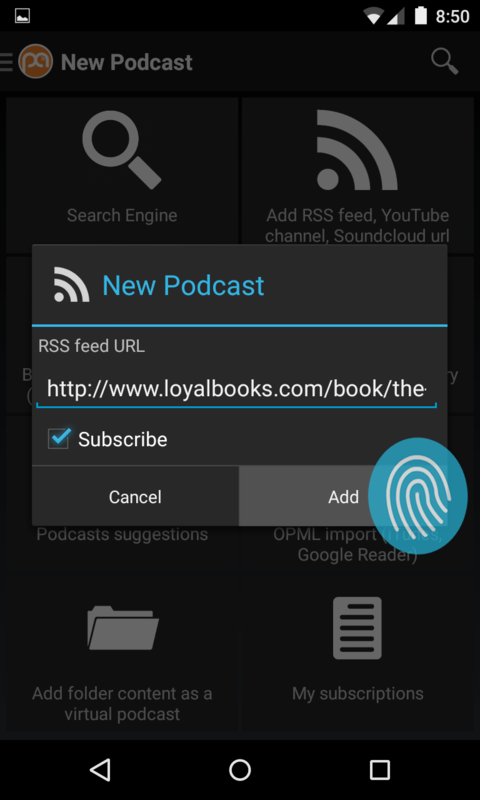 To listen to podcasts on Android you will need to download a podcast or RSS reader app. 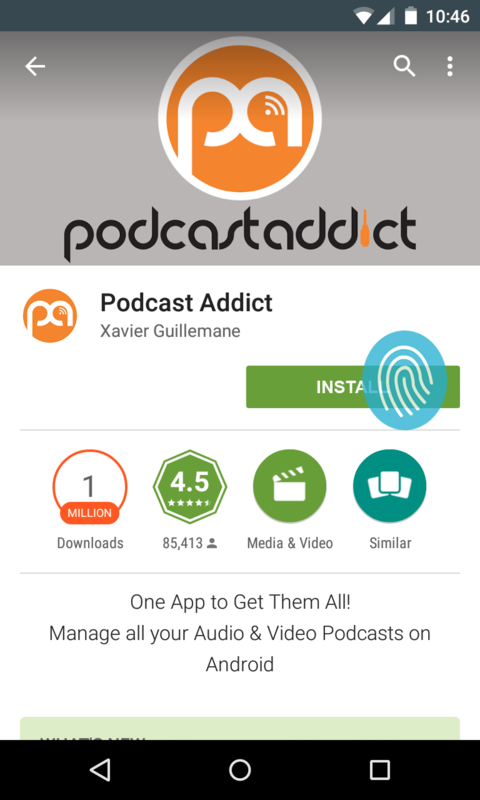 We recommend Podcast Addict because of it’s excellent playback controls that let you adjust the playback speed up to 3x the original speed. 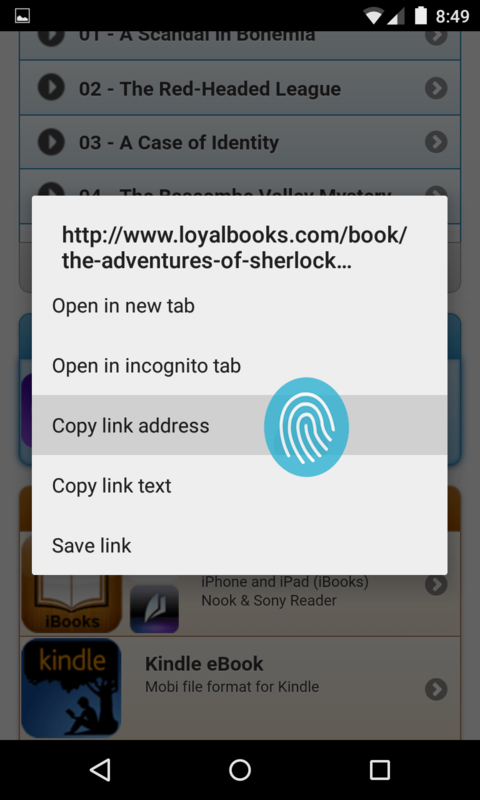 Next browse LoyalBooks.com from your Android phone or tablet for your favorite book. 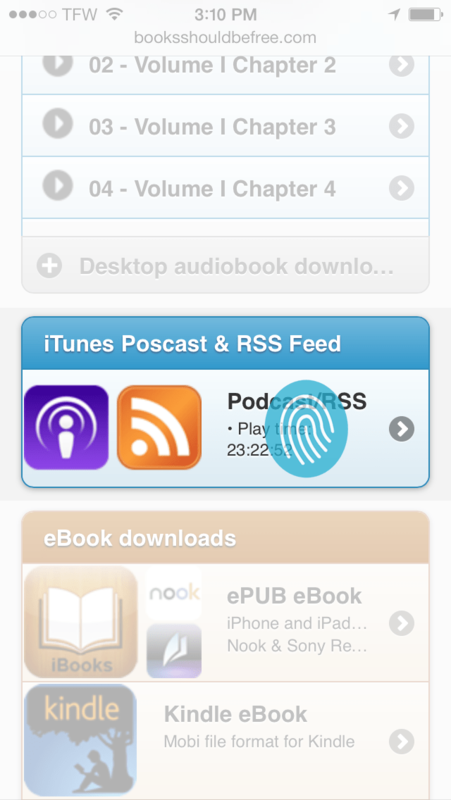 Then press and hold the RSS section. This will bring up the following menu where you can “copy link address”. 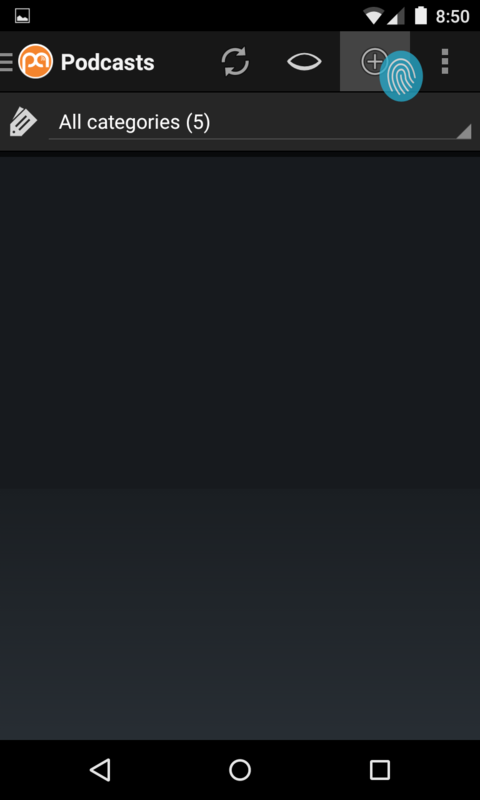 This is necessary because Android opens RSS files natively rather than in external viewers like the Podcast Addict App. 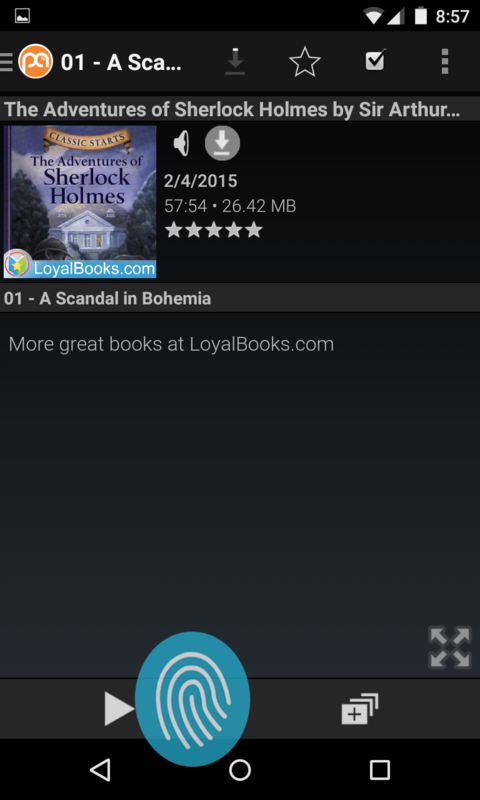 Now we need to open the Podcast Addict app and and add in the RSS file we copied from Loyal Books. The app automatically fills in the URL from the clipboard so all you have to do is touch Add. 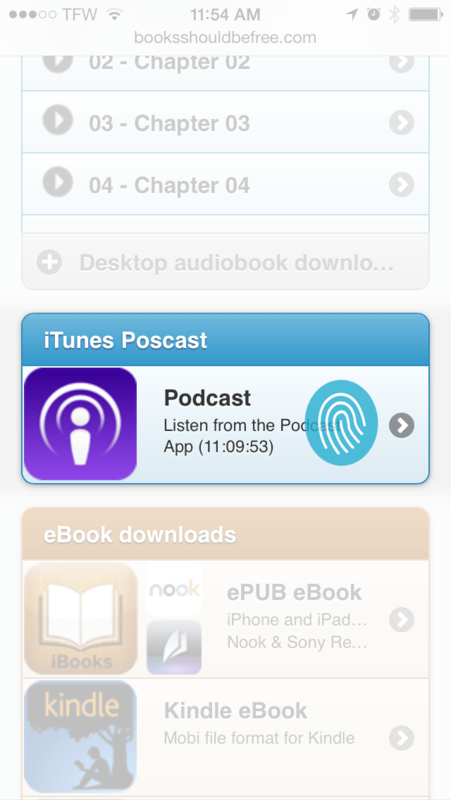 Then you can back out of that screen and select the newly added podcast on the App’s main screen. This brings up the list of chapters. From here you can start listening. 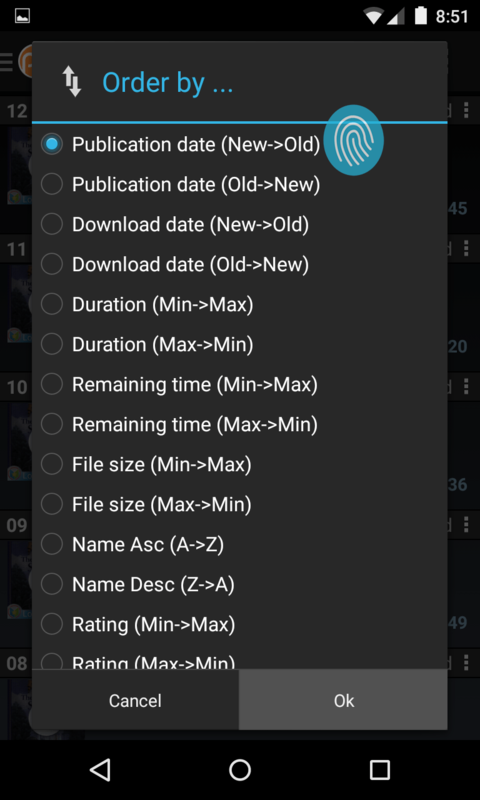 Depending on how your app is configured the chapters may show up in reverse order. If this is the case you can adjust the sort order as follows. If you prefer the image below shows how to download all the chapters of the book for listening offline. Finally, play the book and enjoy!